I don’t know what made me look up from my perch in the passenger seat as we crested a hill outside of Dingle … maybe it was the feeling I was being watched. 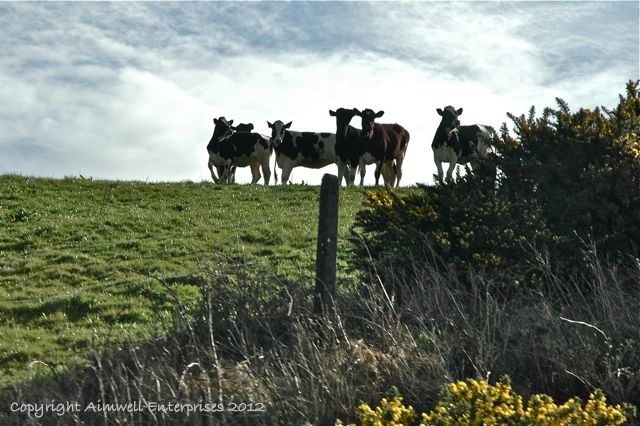 Fortunately I had camera in hand and was able to capture these grazing bovines as they spied us below. Honestly this was a blink-or-miss-it moment and I’m so pleased the image turned out as well as it did. This entry was posted in Animals, Europe, Ireland, Nature, Photography, Travel, Uncategorized and tagged cows, Dingle, image, Ireland, Kerry, Light and shadow, Photography, Travel. Bookmark the permalink. Looking up is so important but did you know there’s also an industry that’s making money looking back. I call it the “Nostalgia Industry”. Francis Frith was an avid photographer like you and photos that appeared many years ago on British postcards may be seen at: http://www.francisfrith.com. You just have to type in a location and, lo and behold, you step into the past. You can also pop the photos into a shopping cart.